IIn the 60’s, Abilene, Texas had a thriving music scene. Bands enamored with the British Invasion sound of The Rolling Stones, The Yardbirds, and The Beatles formed in droves. 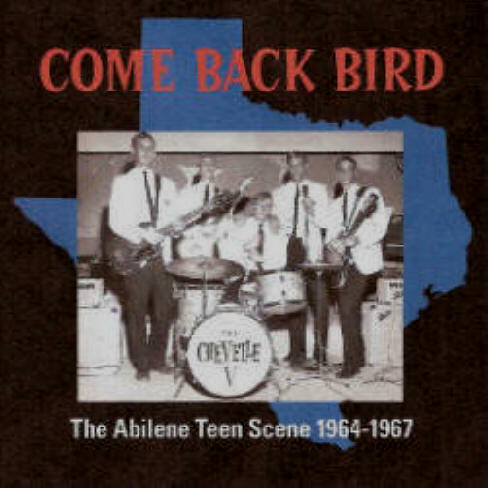 The top band in Abilene was The Chevelle V, whose best known track, “Come Back Bird” employed the British slang for “girl” and the beat of The Yardbirds’ “I’m A Man.” The other popular Abilene bands, such as The Livin’ End, The Continentals and The Coachmen, comprise the other recordings on this album, making this the most complete trip yet to Abilene in the 60’s. Only seven of the recordings were ever released during the 60’s, which reflects the rarity of the recordings included on this collection. Pictured on the front cover are The Chevelle V (l to r) Jimmy Bearden, Bobby Vannoy, Charlie Taylor, Joe Baccus, and Jack Chisholm. All tracks from the original master tapes except track 16,23-4 (vinyl source).